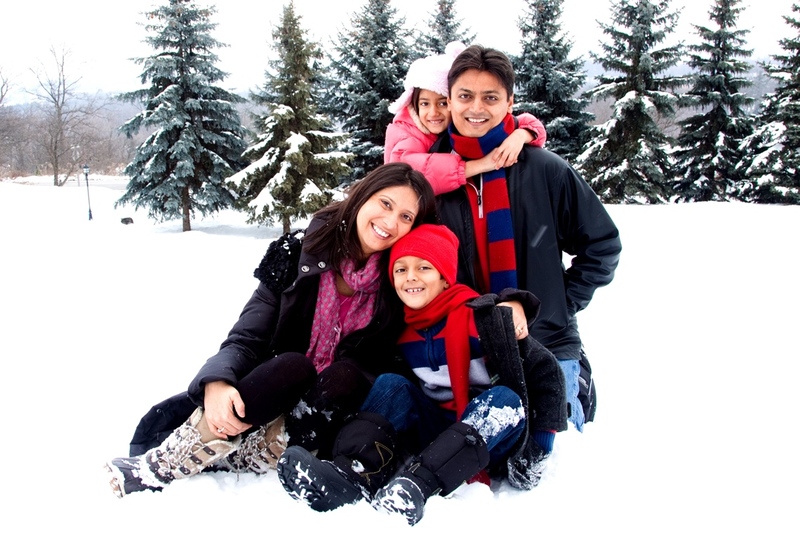 Image of a smiling family. The tradition continues! Presented by Genworth Canada, we invite you to join the Town of Oakville, Oakville Public Library, the Peter Gilgan Family YMCA and community partners as we celebrate Family Day! The Town of Oakville’s eleventh annual Make Your Move Family Day will once again offer a full slate of free activities and special events for all ages and abilities on Monday, February 18, 2019. Open the Family Day schedule (PDF) for details. The Town of Oakville’s recreational swim admission standards apply to all free swims. Wristband policy will be in effect at Glen Abbey pool. Wristbands for admission to all combo and leisure swims will be available starting at 8:30 a.m.
Helmets are strongly recommended. Hockey sticks, pucks and equipment are only permitted (and may be mandatory) during specific activity times. Skate and helmet rentals are available at Joshua’s Creek Arenas, Maple Grove Arena (cash payments only), River Oaks Community Centre, Sixteen Mile Sports Complex and Trafalgar Park Community Centre. Skate and helmet rentals are first-come, first-served. Quantities and sizes are limited. Skate and helmet rental rates apply. Appropriate for ages 3 to 10, The DuffleBag Theatre Company will present Peter Pan on February 18, 2019 at 10 a.m., noon and 2 p.m. at the Queen Elizabeth Park Community and Cultural Centre. Ticket information follows. Tickets for Peter Pan go on sale Friday, January 11, 2019 at 10 a.m. Call the Box Office 905-815-2021 or visit oakvillecentre.ca to order tickets online. General admission, all ages, tickets are $2 each. A limited number of tickets will be available at the door for $5 per ticket on Family Day and sold 30 minutes prior to each performance at the entrance of the Rehearsal Hall. Cheer on the Oakville Blades as they play the Burlington Cougars! Admission to the game is FREE, however wristbands are required and will be available starting at 9 a.m. in the Upper Concourse outside Rink 1. Maximum of five wristbands per person. First-come, first-served. General admission seating. Parking is limited. Residents are encouraged to take public transit to our Make Your Move Family Day locations. For more information on Oakville Transit schedules and fares visit the Oakville Transit website. Image of the Genworth Canada logo. Image of the Oakville Public Library logo. Image of the Peter Gilgan Family YMCA logo.